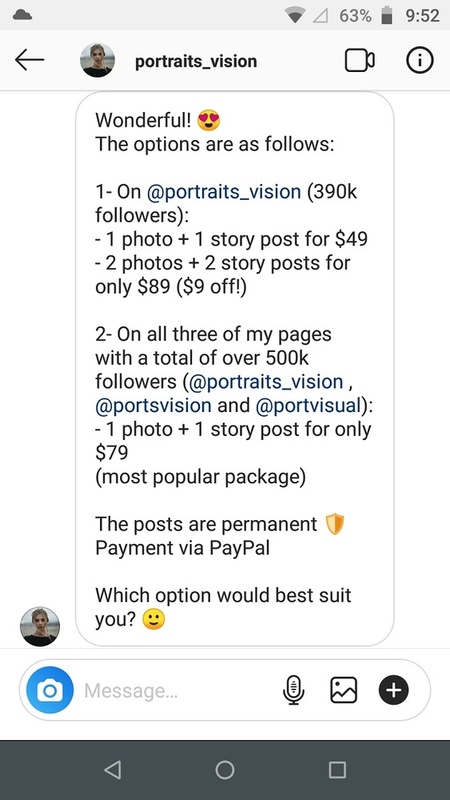 Have you ever wondered how the heck some photographers ended up with tens of thousands or even hundreds of thousands of followers on Instagram? The truth is people did and continue to do some questionable things all in the name of a larger number displayed on their Instagram account. In this video from Brendan van Son, he breaks down a number of different methods that people use to boost their numbers, ranging from mildly questionable tactics to full-blown spam bots and purchasing followers in droves. It's not a well-kept secret that loads of people try everything imaginable to game the system, beat the algorithm, and get Insta-famous, and it's easy to understand why. Instagram tries to train us that our self-worth is measured by how many followers we have, or at least that's the perception we end up with as a by-product of labeling folks as followers. One of the more interesting methods that van Son mentions are the feature pages. While I'm not looking to start any kind of political discussion, Instagram feature pages are tantamount to trickle down economics. The basic concept of these pages is that they use your content to build their page and you get the privilege of paying them to do it with the hope that some percent of people who see your work through them will bother to look into your work and your page. What makes these feature accounts such frauds is that they pose as some kind of fun community asking people to “use our hashtag for a chance to be featured”. What they don't tell you is that the hashtag doesn't matter and that people are paying for the posting. Take a look at these screenshots, these are just a tiny sample of the feature page scam. My two cents? Avoid their hashtags and accounts like the plague, because they are building their bank account on your back. So what do you folks think of all the tactics people use on Instagram which ones do you find most annoying or most ethically questionable? Do you think that there is gray area here or do you see this as cut and dried issue? The old follow then unfollow has to rank pretty highly as far as annoyance goes. Paying for a feature/influence is pretty normal and I don't really see anything wrong with it. Also there's not anyway to really prove that a hashtag isn't featuring content without payment either. It could easily be a mix. I find it all annoying, unethical, and soul-less. Likes and followers are meaningless and shallow, especially since most are not gained through anything genuine or natural. 1,000 followers that provide no revenue, 10,000 followers that provide no revenue, 1,000,000 followers that provide no revenue. Is there a formula out there where with 100,000 I can eat three meals a day EVERY day, with 1,000,000 I can pay rent, with 5,000,000 I can ???? What is the $$$ value of a follower? 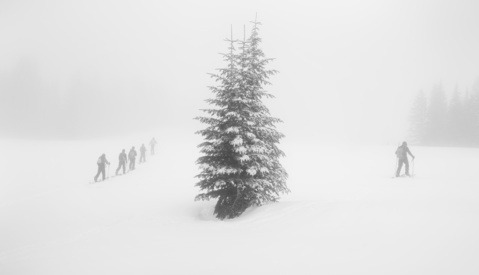 And what is the tipping point? These people realize this is advertising business based on a popularity contest, right? I am no more likely to spend any money on any product because InstaInfluencer "X" says it's "great!" But I'm old and a cynic. It's because the goal is to get work with brands and they want you to have a lot of followers. Oh... So how much time and money goes into gathering these faux followers, and what is the payout? I guess the economics work, but we seem to have created a virtual hunger games with influence being the prize. So you claw and pay and scratch for followers so that you can beg companies to pay you to "showcase" their product, all the while other influencers are doing the same and vying for the same ad dollars. What sheep we have become. I guess make hay while the sun shines... at least until the next shinny thing shows up and the ad dollars follow. It is what it is. The problem is IG's algorithm. If it wasn't for that people would pay for posts like the ones in this article. Jeez, look at all this anger towards Instagram (on other articles too)? I don't really understand the animosity towards the platform. How is it annoying or unethical? If you own a photography store/studio in a small town and pay to run a TV commercial to bring in more portrait clients from broader areas, is that annoying or unethical? Maybe 50,000 people see the TV commercial over the course of a 2 week duration and maybe the conversion is only a handful of good clients that cover the cost of the ad. But it's worth it because it brings in business and adds to your business' reputation. Instagram is another platform for marketing your business. If you look at Instagram as a means to just gain followers or get a hard-on from a feature on an influencer account then that in itself is unethical and meaningless on the photographer's behalf. What I do find unethical is other PHOTOGRAPHERS following your account, waiting for you to follow back and then unfollowing your account just to boost their numbers and ratio of followers to followed. I would argue that's the lamest action in the Instagram community. I noticed I lost a hundred or so followers (around 4%) yesterday and then saw the news that Instagram had 'accidentally' deleted a load of accounts when their AI for removing spam accounts had a bug in it. Some high profile accounts lost a million or so followers! I wonder if Instagram share prices would drop if they lost 4% of users over night, hmmmm. It's probably a higher percentage of bots for the high profile accounts as they have more exposure and hence more bots find them. Anyway, I found it quite entertaining. there is another huge problem, what is the target audience? to whom you wanna reach out? most of these super big accounts on instagram have the same problem like photography magazines and photo community sites, 98% of people there are doing the same like you - photography. 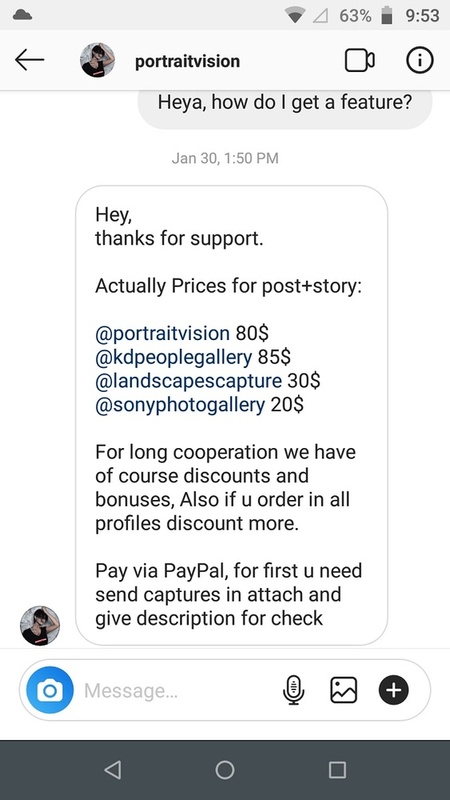 This means you are going to pay to advertise to other photographers. In german we call this "schwanzvergleich". ... And a lot of these big "photo" instagram accounts are tacky as hell - ok this might be fine when you are a wedding photographer or trying to get the girl next door laid after doing a "fashion" shooting. when trying to go this route you have to consider "who are these followers". maybe you have to look into accounts who are not 100% into photo content but into stuff people might be interested in who are potential clients... .